Are you going to vote on Nov. 8th? In the best of all possible worlds, you want your vote to count, right? Maybe if you bullet vote, your vote will count more. Then again, maybe not. In the upcoming election, you can vote for up to 4 of 8 at-Large Councillor candidates and up to 6 of 8 School Committee candidates. If you only vote for one or two of your favorite candidates and no one else, you’re bullet voting. I’ve always been skeptical of this tactic. It sounds sensible and feels like you can swing the election, game the system to help your candidate win. Besides, it couldn’t hurt, could it? Then again, you’re not using all of your votes, potentially letting someone you don’t like squeak through because you didn’t exercise your full privileges. Surely there are four candidates out of 8 that you would rather see win. Consider the following scenario, quoted in full from Larry Davidson’s blog, Learning Strategies. 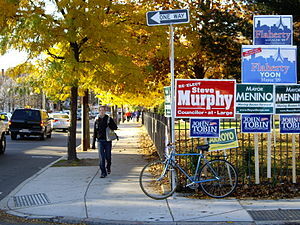 Larry speculated about the effectiveness of bullet voting in the 2005 election for Boston City Council when Sam Yoon was one of the candidates. Suppose you and 20 others agree that your first choice is Sam Yoon and your second choice is Matt O’Malley. And suppose, before your 21 ballots are counted, Yoon is in a tight race for fourth place, just 13 votes behind O’Malley. If the 21 of you bullet-vote for Yoon, your votes put him 8 votes ahead of O’Malley for fourth place, letting Yoon squeak in. But if the 21 of you dilute your support by voting for both of these fine candidates, Yoon remains 13 votes behind O’Malley, who then pushes Yoon out of fourth place. Net result: your second choice would be elected and your first choice defeated. Bullet voting is clearly the correct strategy. On the other hand, there is also an argument against bullet voting. To understand this argument we have to consider a candidate of medium popularity whom you definitely do not want elected. Let’s call him Steve Murphy, to pick a name at random. Now suppose Murphy is 13 votes ahead of O’Malley for fourth place before the 21 ballots from you and your friends are counted. And suppose that Yoon is way ahead (or way behind, it doesn’t matter which), so your 21 votes for Yoon won’t make any difference in his election. If you bullet-vote for Yoon, what happens? Murphy gets elected by finishing in fourth place! But if you each cast two votes — one for Yoon and one for O’Malley — then O’Malley finishes 8 votes ahead of Murphy and squeaks in for a fourth-place victory! Net result of refusing to bullet-vote: your second choice would be elected and your last choice would be defeated. Bullet voting is clearly not the correct strategy! You’ve got to admit, the success of your bullet vote depends a lot on the assumptions you make about each candidate’s chances for winning. The house of cards you build can very easily fall. There are just too many variables and permutations of voting behavior to consider. So, will bullet voting work in the upcoming election? I think it’s impossible to know. The scenarios cited above are just two of an infinite number of possible eventualities. Even so, take a look at the results of the September 20th primary election for Lynn City Council and School Committee, taken directly from the city of Lynn website. When I first thought about writing this post, I thought that there were too many variables to justify bullet voting. Now, I’m not so sure. I also wrestled with the wisdom of substituting our Lynn candidate’s names for Davidson’s Boston candidates in the selection I quoted from his blog. I know how I feel about each candidate, but would rather allow you, the reader, to draw your own conclusions. How effectively is each candidate working to get his base out to vote? How much money does each candidate have left to spend? Both of these questions may impact how close the races are. If a contender has a deep war chest and uses it wisely, he’s likely to do better than expected. ← Happy Anniversary, Social Capital Inc. I liken it to taking a shot in the dark. You hope you hit your target, but only know if you succeed by the results of the next day. It seems to me that the stars have to be aligned just right for it to work in your favor. And those last three words “in your favor” are crucial because everyone voting tomorrow is empowered to make their own choice. I think I’m going to use all of my votes because I don’t think my holding back will significantly alter the results. There are 3 people I’m definitely voting for because I believe in them. There are one or two I wouldn’t vote for under any circumstances. That leaves a couple up in the air for me. I don’t know as much about them as I should and they haven’t made an effort to reach out to people like me. The important thing is that you vote, period. Thanks for commenting. Interesting you should mention those who made an effort to reach out to certain kinds of voters. The only At-Large candidates I’ve met in the Highlands are Net and Funez. That speaks to what each candidate’s base is, who they’re trying to appeal to. Actually I shouldn’t say that they didn’t make an effort. For whatever reason, I didn’t get their message. Hong worked hard and was very effective in getting his message out as far as I was concerned. I didn’t see the same level of outreach from Funez.